Our community resolutions are moving along, and we are pleased to hear that so many of you are actively following our series and taking up the challenge. Our Friends of Clyde River group has organized the Lecture Series and Joy Fit classes to support the “learn something new” and “get a little more fit” resolutions, and both are receiving high interest from communities near and far. We received good feedback from the PEI Public Library when we mentioned all the good things that the Cornwall Library has to offer. Give yourselves a big pat on the back for your great attitude and participation in these resolutions. As we approach Valentine’s Day and this being heart month, it’s the time of year when we take that little extra step to show the people around us how much we love and appreciate them. Now we don’t want you to undo all your extra work in getting a little more fit, so we have a community solution for you. Bake some cookies and give a portion of them to your friends, neighbours and seniors in your life. You could even accompany your gifts with a little note, poem or drawing from you or your children. These thoughtful gestures can turn around someone’s day in a big way. 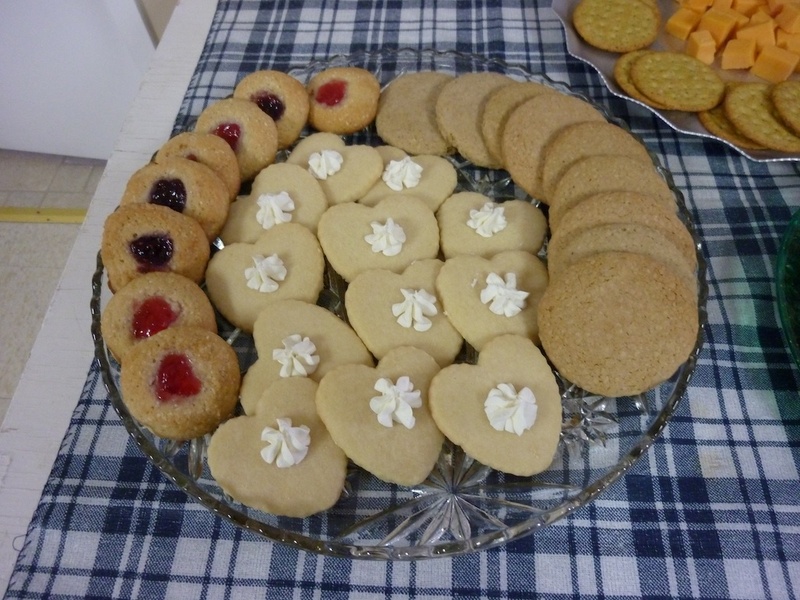 We noticed at the last Clyde River lecture that Sandra Cameron brought along some heart-shaped sugar cookies and I do believe she had next to none left to take home because they were so good. We asked Sandra for her recipe, so maybe these might be the treats you bake to show your love. Add to creamed mixture and combine well. Chill dough. Turn chilled dough unto a lightly-floured surface. Roll to 1/8″ thickness and cut out with a heart-shaped cutter. Bake on greased cookie sheet in 375 degree oven for 6 to 8 minutes. Place a dollop of icing in centre and add a red or pink smartie for Valentine’s Day. We wish you all a wonderful Valentine’s Day!